If you have a longboarder in your life, here are some great holiday shopping ideas for any budget. Included below are the top 10 recommendations for longboard accessories, decks, wheels, and safety equipment for your longboarding enthusiast. When you are sliding downhill, you are not going to want to be without these gloves. The Triple Eight Sliders Longboard Gloves are made out of a breathable, full top grain leather with tear resistant Kevlar fingertips. 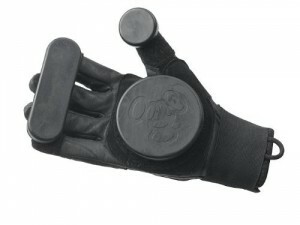 They also feature durable and removable thumb pucks, finger bars, and slider palm pucks. Replacement pucks and bars can be purchased if necessary. The wrap around Velcro wrist straps make sure the gloves fit snugly. These gloves are an absolute must have for sliding, especially if you are a beginner. Practice your moves with the flexibility and protection you need. You may have seen these innovative 70 mm wheels featured on Shark Tank. The Shark Wheel company has completely reinvented the wheel. The Sidewinder wheels are a hybrid between a sphere and a cube. The sine-wave shape makes them look square when the roll, though they are far superior to most of the other wheels on the market. The unique design gives you a faster, more controlled, and the smoother ride that you will be able to notice immediately. They are perfect for wet conditions and rough terrain, high-performance riding or just cruising. Not to mention, they come in a variety of fun and bright colors. Gullwing consistently delivers some of the most innovative, progressive, and highest quality trucks on the market, this is no exception. This is the newest version of their double kingpin carving truck. It has a much sleeker design than previous models and features a customized base plate. 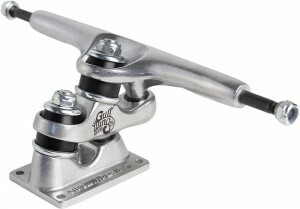 Although, the 10-inch silver trucks still emulate the standard, old school truck mounts. 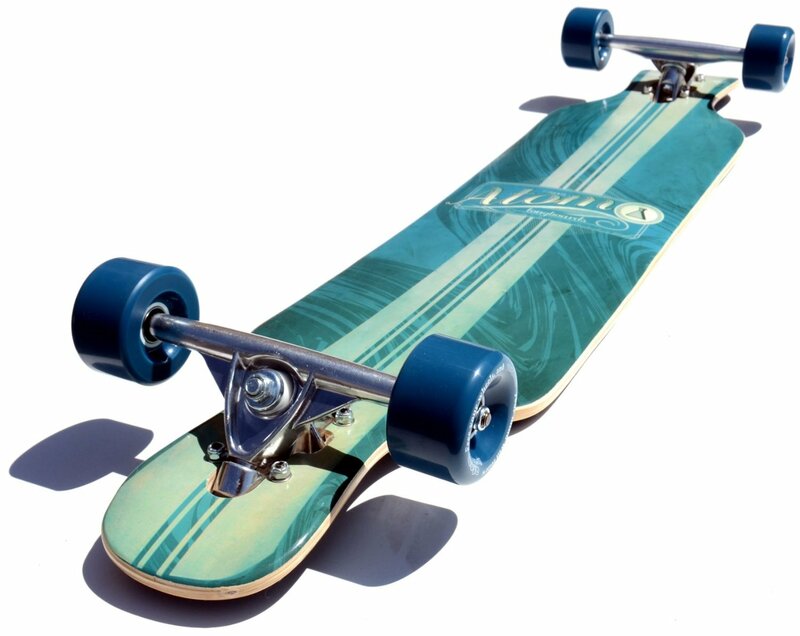 Having these trucks on your board will give you a very smooth and stable ride. The deep carves and clean leans you will be able to take will make you feel like you are surfing on concrete. These trucks are a great addition to any board, whether you are just starting out or you are an old pro. 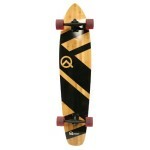 The Arbor Axis Longboard Deck is made of a durable eight-ply walnut. This drop-through board measures L 40.00″ by W 9.00″ and features a geometric ocean print. The snowboard inspired design makes it possible for you to ride regular or switch with the same smooth speeds and tight turns. This board gives you a ride that is extremely smooth and responsive, while still remaining stable for high-speed riding. The Arbor Axis is the perfect board for all of your riding needs, whether you are cruising, freeriding, or driving down hills. These standard sized bearings brought to you by the best-selling skate bearing brand in the USA, will fit on any wheel that uses a 608 bearing. The single, non-contact rubber shield is removable for easy cleaning. The high-speed nylon ball retainer gives you more speed and strength. These bearings come pre-lubricated with Speed Cream racing lubricant. 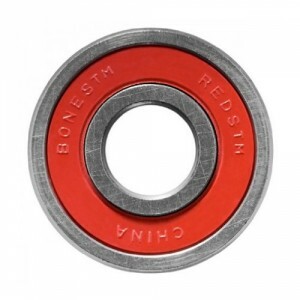 With these bearings on your board, you will notice a smoother ride and longer roll. This is as close to frictionless as you can get, especially at such a low cost. They are easy to put on and the red adds a nice cosmetic touch. The pack includes a set of eight bearings, instructions, and logo sticker. For a few dollars more, you will receive everything in the first pack plus speed rings, spacers, and T-Tool. 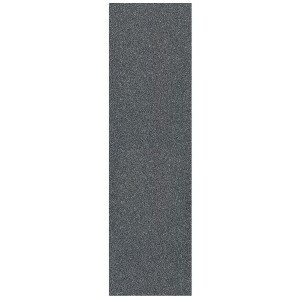 This 9″ by 33″ sheet of grip tape is a must-have for every longboarder. The unique silicon-carbide grit binding process used by Mob Grip creates a product that will not easily wear out. Its adhesive can withstand all types of extreme weather and is even waterproof. This high strength premium grip tape is tear proof and trims cleanly every time. No need to worry about bubbles. This sheet is perforated with hundreds of minuscule slits that allow air to escape and no bubbles to form. It is easy to apply and can have many uses. It can even be applied on your penny board! This grip tape is truly a step above the rest. 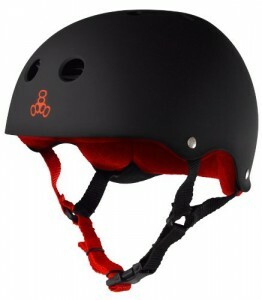 The Triple eight Helmet combines style and functionality into one affordable package. 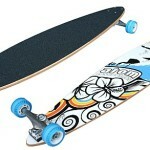 Its multi-impact design was created with skaters in mind. This helmet is a throwback to the classic sidecut skate helmets of the past, but still with Triple Eight customized logo rivets. What really sets this helmet apart from all the rest is the original Sweatsaver Liner. This padding integrates a moisture-wicking layer to eliminate sweat and an anti-bacterial treatment that makes it essentially smell proof. The liner provides 360 wraparound coverage and is encased in an itch free terrycloth that will keep you comfortable for even the longest ride sessions. When you purchase this helmet, you can choose from more than 15 distinct colors with a unique rubber or glossy finish. It is also available in six different sizes and features adjustable straps for an even better fit. 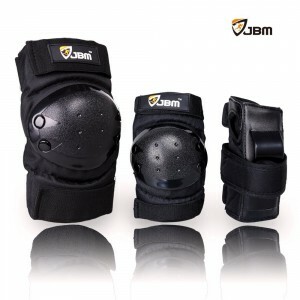 JBM’s gear set includes knee pads, elbow pads, and wrist guards that are sized for adults and children alike. The pads are all incredibly durable, with the hard plastic plates, and comfortable, with the soft EVA padding. 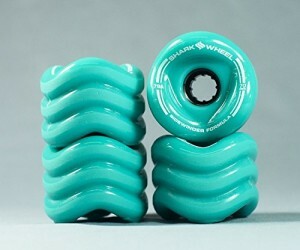 They are perfect for skateboarding, cycling, roller skating, and all sorts of other extreme sports. Multiple elastic straps and Velcro closures give you a highly adjustable and secure fit. These lightweight pads are also available in six color options. Safety is very important and you will not find a better deal than the JBM 3 in 1 Gear Set. You can save yourself a lot of pain by adding these to your Christmas list now. 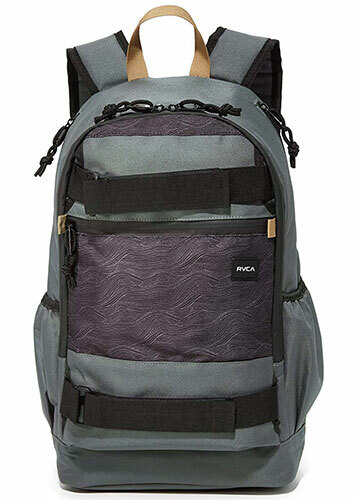 This backpack made by RVCA is any skater’s dream pack. The Push Skate Backpack is offered in six colors, including one camouflage print. This pack features a spacious main compartment, a large front pocket, a side water bottle pouch, and a side zippered media pocket. There is even a padded laptop sleeve designed to hold laptops up to 15 inches in length. The shoulder straps are padded and adjustable to provide you with maximum comfort. It is also very well made and durable. It is the perfect size to carry everything you need without being too bulky. There is plenty of space in the many compartments to carry your laptop, your penny board, and anything else you may need. The pack’s simple design looks good and you will feel good carrying it. 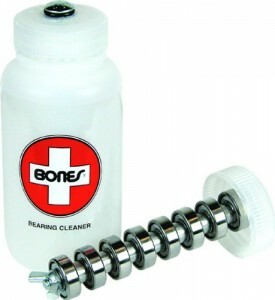 Bones Skate makes cleaning your bearings fast and easy with this handy cleaning unit. Just slide your bearings into the polyurethane cleaning unit, apply a cleaning solvent, and watch as the dirt and grime wash away. The unique design utilizes spacers so the cleaning solvent reaches all bearings equally. There are seven spacers, which means you can clean up to eight bearings at once. In addition, this ingenious tool is compatible with all types of skate bearings. Long and arduous skateboard maintenance is a thing of the past when the Bones Skate Bearings Cleaning Unit does all the work for you. This durable unit gives you a thorough clean in less time. In no time at all, you will be back outside, enjoying a smoother and faster ride.